Our range of products include automatic shoe cleaning machine. Our sole cleaning machines are 2 in 1 – dual system, so you can clean your sole as well as polish your shoes. Fitted with the infrared sensor, fully automatic with two motors. 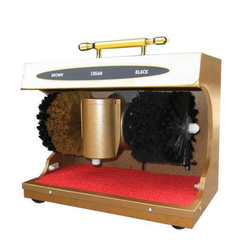 Container for shoe shiner wax, shoe shining buffing threaded wheels for polishing black/brown shoes. Bottom wheels fitted with nylon bristles for effective cleaning of soles. Equipment takes up the very small amount of space, and portable. Looking for Automatic Shoe Sole Cleaning Machine ?